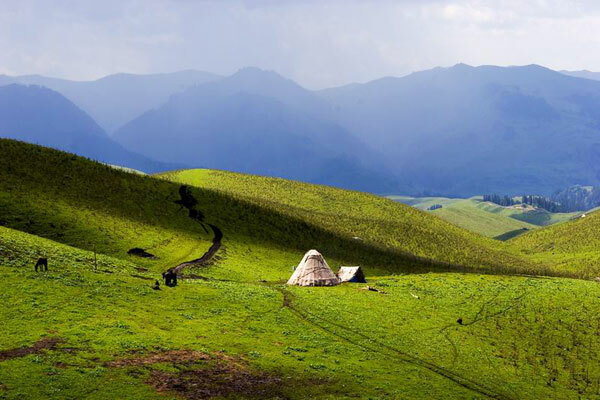 Lying at the north foot of the Tianshan Mountain, Ili Kazak Autonomous Prefecture is in the west of Xinjiang Uygur Autonomous Region, bounded on the northeast by Russia and Mongolia, on the west by Kazakhstan. Ili is located in the heart of Central Asia. The Tianshan Mountains, the Altai Mountains, the Poluokenu Mountains, the Junggar Basin and the Monglkvre-Tekes Basin make up the main landforms of Ili, along with the Ili River, the Erqis River and their valleys. The prefecture enjoys a cool, temperate, semi-arid, continental climate. Owing to the vast expanse of land, there are also microclimate features in different regions. Generally, Ili's summers are short and the winters, long. The temperature varies greatly between day and night. The temperature in spring rises rapidly but unstably, while the autumn temperatures drop rapidly. Summer and autumn are the best time in Ili. The pastures are verdant. Melons and fruits are ripe. Notable is the sunset in Ili River. It is the favorite of many photographers. Special Local Products: lavender and black currant. Scenic Spots is one of the most beautiful scenic spots in Xinjiang. The terrain is steep and wildlife ranges up and down the gorge. 1. Yining Airport is only 5 kilometers (3 miles) from downtown Gulja City, operating flights to Urumqi and Kashgar. 2. Kazak is the largest ethnic minority of Ili, and the Kazaks are hospitable. Visitors should be sure to see their traditional food and costumes.